The Torin T32001 Foldable Engine Hoist is a two ton heavy duty foldable engine lift that is manufactured from high grade steel. 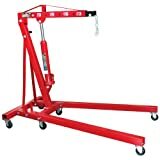 The 2 ton hoist has a wide range of lift that starts from as low as 1 inch to 78.75 inches of lift. The hoist features a heavy duty hydraulic jack that is capable of carrying out the activity with minimal effort; the four holes in the Torin hoist and the eight ton long ram make it easy to vary the lifting range while the six wheels make it very mobile. Lifting range: 1inch-78.75inch: – The wide range of lift will enable any engine under two tons to be easily hoisted out of a car and also installed easily. The variable range thus gives a person the option of choosing the ideal range to suit a specific work undertaking. 6 wheels for added mobility: The attached wheels are manufactured from durable material, the wheels act as the support for the engine hoist and also allow for easy mobility of the hoist. 4 hole position boom: This allows different engines to be hoisted or installed at different positions easily and efficiently while using minimal energy while doing so. Heavy duty 8 ton long ram: The heavy duty ram made from strengthened steel is able to withstand high tensile stress thus making the work undertaking safe and secure; this will offer long lasting service with minimal maintenance costs. Foldable design: The easy folding mechanism makes the two ton Torin T32001 Foldable Engine Hoist very versatile hence can be used in different applications while still remaining very portable.